For a company, organization, school or nonprofit to succeed, it needs to be thoroughly organized. It also needs to have a management team that strives to reach the goals of the organization even if that means taking risks. In the business world, this is known as business administration. Business administration is made up of people who manage an organization and the processes that help run it. For a business administrator to do this successfully, he or she must be taught the skillset needed to make a company thrive. The skillsets needed include management, strategic thinking, administrative law and policy, statistical analysis, and organization structure in operations. Accounting, corporate and healthcare finance, organizational structure in operations, and domestic and international marketing are some of the courses taught in a regionally accredited curriculum. If you aspire to have a career in a major company, you will need these skills. 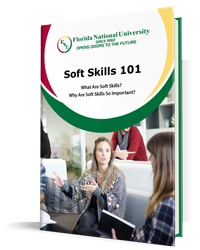 Luckily, you can learn these skills at Florida National University (FNU). Not only does FNU prepare our students for the difficult tasks of managing a company of any size, we also prepare them for an industry that is actively seeing growth. 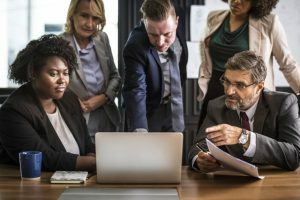 According to the United States Department of Labor’s Bureau of Labor Statistics, employment of administrative services managers is expected to grow 10 percent from 2016 to 2026, faster than the average for all occupations. No matter which degree program you choose, an associates, bachelors, or masters—you are one step closer to kick-starting your career as a business administrator in Miami, Florida. Let’s take a closer look at the four different business administration programs offered at FNU. The Associate of Arts in Business Administration (AA) program is designed for students who are seeking an academically liberal approach to their studies. Students enrolled in this program will learn first-level fundamentals of business administration. Students will also take key introductory courses that are related to business management and administration. These courses include business law, ethics and social responsibilities, microeconomics, and business management. Students will also learn the basics of marketing. During this 60 credit-hour program, students are required to take coursework that offers more flexibility concerning general education requirements. In other words, this degree program is more lenient regarding core requirements. If you are looking for a business program that offers more technical courses on business administration but not yet ready to enroll in a bachelor’s program, then you should look into FNU’s Associate of Science (AS) in Business Administration program. While the AS program offers many of the same courses of the AA program, there are less general core requirements. In this degree program, students can focus more on accounting and other business-related electives. Students who are enrolled in the AS program will take second level accounting courses. They will also delve more in-depth with applying the principles they learn to managerial accounting and build on their basic marketing skills by enrolling in courses like the Introduction to International Marketing. Also, they will enroll in courses that will teach them strong communication principles that will be needed to thrive as a business administrator. It is worth noting that if you are enrolled in the AS Business Administration program, FNU strongly suggests that students enroll in an Income Tax Accounting course since it is a subject that each adult will have to deal with every year. If you want to advance your education beyond an associate’s degree, you may wish to enroll in FNU’s Bachelor of Science (BS) in Business Administration program. 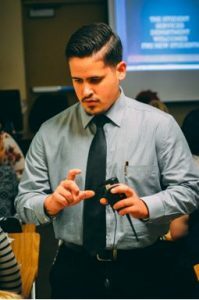 The program is composed of 120 credit hours, and the core requirements are split into lower and upper-level courses, where students must complete a minimum of 52 credit hours. Students enrolled in the BS in Business Administration program will also have the opportunity to choose a concentration in accounting, finance, general management, marketing, and sports medicine. Each level requires between 18 and 20 credit hours. FNU’s Masters in Business Administration (MBA) program is designed to advance a student’s education even further by taking it to the next level. This MBA program is a one-year program that reinforces a student’s skills in specific areas like communication and business organization. They will also learn how to identify and solve problems through quantitative analyses which they will study in-depth. The MBA program allows students the option to master the concentration they chose in their undergraduate degree. They can also expand their college transcripts in the areas of finance, general management, health services and administration, marketing, and public management and leadership. 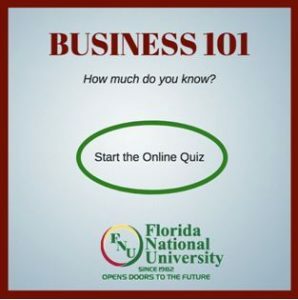 Enroll in an FNU Business Administration Program Today! Now that you know the different careers that you can have as a business administrator and the various business programs FNU has to offer, enroll in a business administrator program today to kick-start your career. Contact an academic advisor today to learn about financial aid and online courses. At FNU, we offer many of our programs entirely online. Contact FNU today and have all of your questions answered!